One of the most frequently asked questions I hear from America College of Healthcare Sciences students, graduates, and aroma-enthusiasts is: How do I become a Registered Aromatherapist (RA)? As you may already know, an RA is an aromatherapist who has successfully demonstrated a core body of aromatherapy knowledge by passing the Aromatherapy Registration Council’s (ARC) Examination. The ARC RA Examination’s primary focus is the safe administration of essential oils and covers topics such as scientific principles, administration, and professional issues in aromatherapy. It is also available in a number of languages, including English, Japanese, and Korean. In mid-2015, it will be available in Chinese. Once you have successfully passed the ARC RA Examination, you are added to the online international database of ARC Registered Aromatherapists. The RA registration (which is valid for five years) confirms your high standard of aromatherapy education and demonstrates a commitment to the ethical, safe use and administration of essential oils when working with the public. An additional perk: the ARC will also verify your registration status at the request of employers, government agencies, and anyone who needs to verify your professional qualifications. Step 1 – Ask Yourself: Am I Qualified to take the ARC Exam? Complete a minimum of 200 hours in a Level II or III aromatherapy program that is in compliance with the current National Association for Holistic Aromatherapy (NAHA) or Alliance of International Aromatherapists (AIA) Educational Guidelines or provide evidence of equivalent training (be sure you include your transcripts and/or syllabi in your application). If you are not sure that your school’s curriculum is covered in the “core body of knowledge,” download the ARC’s Candidate Handbook. You can also encourage your school or aromatherapy training institute to submit final examination questions confidentially to Professional Testing Corporation (PTC) who oversee the exam administration and management. The Candidate Handbook is a must-have resource when preparing for the ARC Exam. You can download your copy from the PTC’s website here. Plus it will give you examples of Exam questions! Once you’ve reviewed the Candidate Handbook, you’ll have a good idea of what to expect on the Examination. From there, you can continue to study the relevant course materials you’ve saved from your Level II or III aromatherapy program. You can also check out the recommended reading on page 10 of the Candidate Handbook. The ARC Examination is a computer or a paper-and-pencil examination (with a score of 70% or higher to pass) composed of a maximum of 250 multiple choice questions with a total testing time of four hours. Need some practice questions? Don’t forget to utilize the sample questions in the Candidate Handbook. Drink plenty of water—hydration is good for the brain! Reminder: Don’t forget to include your transcripts and/or syllabi from your Level II or Level III aromatherapy program. Pay by check or money order: Make payable to: PROFESSIONAL TESTING CORPORATION and include in your application packet. Pay by card: Visa, MasterCard, and American Express are also accepted, and you can complete the Credit Card Payment section on the Application. DO NOT send cash—be sure to pay through one of the two options listed above. The next ARC application deadline is March 1, 2015, so it’s time to begin gathering your materials and preparing for the Examination (as I mentioned above, the upcoming dates can be found here: http://aromatherapycouncil.org/?page_id=86). Now it’s time to take your exam! Once you’ve submitted your application, PTC will contact you within six weeks with an Eligibility Notice. The Eligibility Notice will tell you how to schedule your examination appointment, and it will also remind you of the available exam dates. The ARC Examination is offered during an established two-week testing period, Monday through Saturday, excluding holidays. You may have different instructions if you are taking the paper-based exam in Japanese or Korean, so be sure to read your Eligibility Notice carefully. Remember: Exam appointment times are first-come, first-served, so schedule your appointment as soon as you receive your Eligibility Notice. This will increase your chances of being able to take the exam at your preferred location and time. To find a testing center near you, visit www.ptcny.com/cbt/sites.htm or call PSI Exams Online at (800) 733-9267. 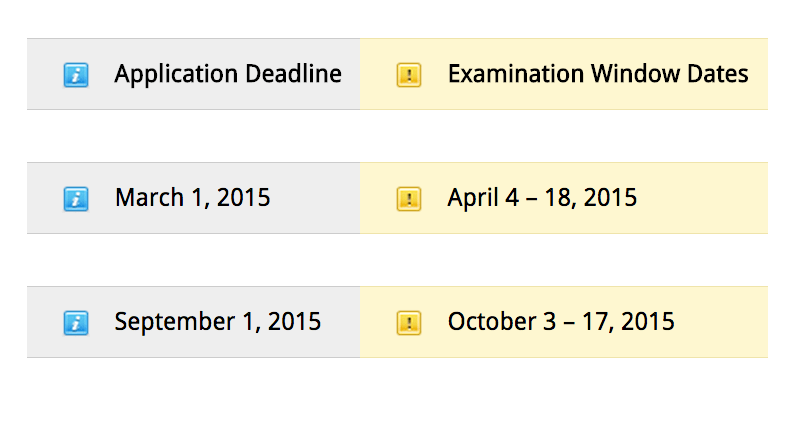 Once you’ve scheduled your appointment, PSI will send you a confirmation email with the date, time, and location of your exam. Be sure to review this information carefully, and contact PSI immediately if you notice any errors. Remember to plan accordingly on the day of your exam: The exam is proctored and you are not permitted to leave the room (even for a toilet break! ), so be prepared. You are not permitted to take any paper, books, or iPhones into the examination room. Be sure to get plenty of sleep the night before, drink lots of water, eat a nutritious breakfast, and allow for adequate travel time so you arrive at your examination center on time and ready to succeed! Don’t try to “study crunch” the night before. If you’ve taken the time to study in the weeks leading up to the exam, you’re already set up for success. Once you have completed your exam it will be sent to PTC for grading. If you’ve successfully passed the exam, PTC will notify the ARC that you are successful candidate (congratulations!). The ARC will then prepare a Registration Certificate and update the Register. This process can take four to six weeks. If you’ve passed the Exam, your test results and your Registration packet will be mailed to you. As a successful registrant, make sure to email the ARC to confirm any details you would like listed on the Register. The ARC will automatically list your name and address, but you can also request to have your website, phone number, and email included on your listing. As I mentioned above, one perk of passing the Examination and becoming an RA is that the ARC will verify your registration status at the request of employers, government agencies, the public, or anyone with whom you wish to share your new credential. The ARC will only release your RA status, the date your registration was awarded, and any disciplinary actions taken by the ARC. Step 9 – Utilize Your New RA Credential! Teach clients how to achieve and sustain good health on a daily basis by incorporating essential oils into their life, and share other natural modalities to supplement their healthy lifestyle if you have the training. Empower clients to achieve improved health through addressing any imbalances caused by a lack of quality sleep, adequate pure water, exercise, fresh air, and relaxation. Help clients to evaluate their lifestyle choices to identify and change any potential causes of ill health and create a wellness plan. But remember, unless you have previous qualifications and training as a Registered Aromatherapist (RA), you are not a licensed physician. You must be vigilant and aware of the current legislation in your state on the practice of aromatherapy. Diagnose disease. An aromatherapist will always refer clients back to their primary care physicians for a diagnosis if necessary. Treat disease. An aromatherapist’s focus is on health and education, not on disease. Prescribe drugs or pharmaceuticals. Aromatherapists teach clients about essential oils. Perform invasive procedures. Depending on training and licensing, a natural health practitioner may use hands-on techniques, like reflexology. Practice unsafe administration techniques such as Raindrop Therapy or Raindrop Technique. Registration is recognized for a maximum period of five years. To maintain Registration, you must be in compliance with the ARC Disciplinary Policy. You must also be in compliance with other ARC standards, policies, and procedures. Either retake and pass the then-current Registration Examination or meet continuing education requirements (see information below). All RAs are responsible for maintaining continuing education records used for the Application. List all continuing education activities. Pay the $325 renewal fee. 100 contact hours are equal to 100 actual continuing education hours. Hours must be provided by any approved educational body or organization, or by a NAHA- or AIA-approved school or educator. Training in Raindrop Therapy or Raindrop Technique does not count as this is not approved as a safe administration method by ARC. Aromatherapists have been taking the Registration Examination since its inception, and the number of Registered Aromatherapists (RA) continues to grow, even spreading across the globe. There are RAs in China, France, Hong Kong, Singapore Japan, Korea, and the United States. At the American College, students from all over the world have successfully completed their ACHS aromatherapy program and passed the ARC Examination and received the “RA” distinction. In fact, ACHS Aromatherapy graduates have a 100% success rate over five-years (2009-2013). There are tremendous benefits to becoming a Registered Aromatherapist (RA). This credential helps reinforce a standard of excellence and safety in the profession of aromatherapy, and I am encouraged that more and more aromatherapists join the registry each year. This post first appeared on the blog of the American College of Healthcare Sciences on January 29, 2015. Reprinted with permission. Dorene Petersen is the Founder, President, CEO, and Principal of the American College of Healthcare Sciences (ACHS). She has over 35 years clinical teaching and lecturing experience in aromatherapy and other holistic health subjects. She has presented papers on essential oils and clinical aromatherapy at the International Federation of Essential Oils and Aroma Trades Annual Conference (IFEAT) in California, USA; the Aroma Environment Association of Japan (AEAJ) in Tokyo, Japan; the Asian Aroma Ingredients Congress (AAIC) and Expo in Bali, Indonesia; the International Center of Advanced Aromatherapy (ICAA) at the WonGwang Digital University in Seoul, Korea; as well as the AAIC Expo in Kunming, Yunnan, China. Dorene currently serves as Chair of the Aromatherapy Registration Council (ARC), and she is also active with the Distance Education Training Council (DETC). Dorene is a travel junkie, and she hopes you will join her for the ACHS Study Abroad Program in Indonesia and India in 2015!